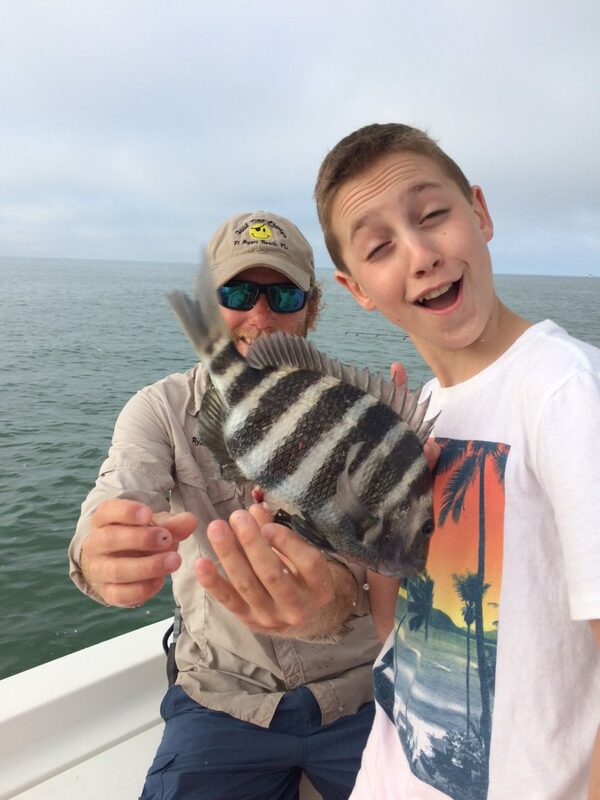 Blog Kids of all ages can enjoy fishing near Fort Myers Beach! We love fishing with kids and families. It is so rewarding to see families together enjoying some outdoor fun and fishing. We love this photo shared with us from a recent charter. The timing was perfect! This time of year we get sheepshead in and some are averaging 4-5 lbs. These are often confused with a freshwater fish because of the name. But don’t worry folks, this is a saltwater species and they are delicious. My favorite preparation is to crumble up honey bunches of oats cereal to create a breading on the fish then deep fry. Make some homemade tarter and a mango hot sauce to boot. sooo goood. Get out on the water on Fort Myers beach and have fun! Coming down the first week of June. Considering a 4 hr trip. Two adults and 5 year old grandson. Been down twice before but worrying that grandson too young to fish. Thinking a combo fishing/shelling/dolphin trip. What would you recommend? Hi Dennis and thank you for reaching out to us! We love fishing with kids and families. Capt Ryan can assist with baiting and casting as needed. We can also find dolphins or add in an island stop if you want to get off the boat for a swim. We have charters available that week and have availability online with real time availability: https://paradisecharters.com/book/ Please let us know if you have any questions. It is best to call 239-247-8288 or email [email protected] Thank you!